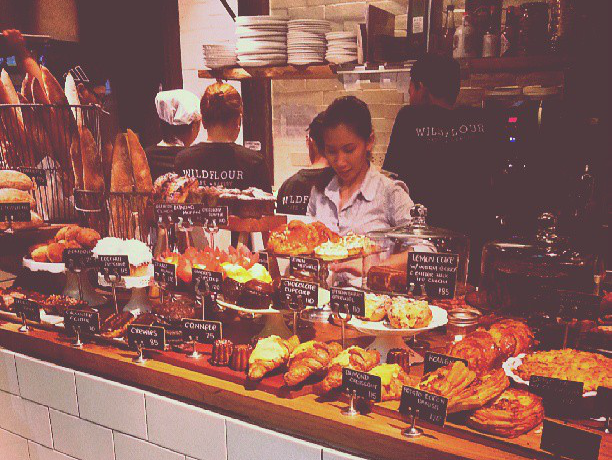 Or Wildflour Cafe + Bakery's croissant donuts rather. There was the cupcake craze, the milk tea craze and now, the Cronut invasion? For a little background, Cronuts began making news in this side of the world last June, I think. Or at least that's when I first started hearing the buzz about it. I read an article in Pepper.ph about the mania around this hybrid pastry in New York, selling price of $5, and I got to admit, the photos of all the long lines I've seen and the uniqueness got me interested. Why did it gain such a following? 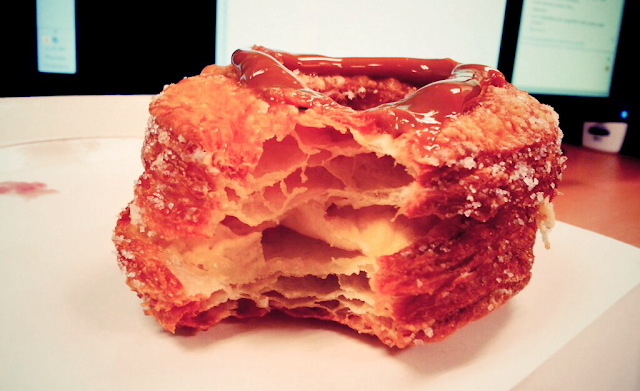 Chef Dominique Ansel (of the namesake bakery that launched Cronuts) was, for one, innovative. Croissants and donuts are already delicious on its own, and this combination of the two was certainly a genius move. (We'll never really know if Ansel was the first one to come up with this idea but if he's not, he seemed to be in the right place at the right time.) It was something you've never heard, seen or tasted before so it's natural that people would certainly try it. Then, all the exposure through the social media even made it more popular as it spread like wildfire from New York to Manila (if you also got someone like Anthony Bourdain to try your food, it's almost a done deal). I think the limit of 250 pieces a day also pumps up the want to have it exceedingly more. Then the wave of Cronut clones followed. Not everyone can be in New York so, I guess, this is a good thing, right? 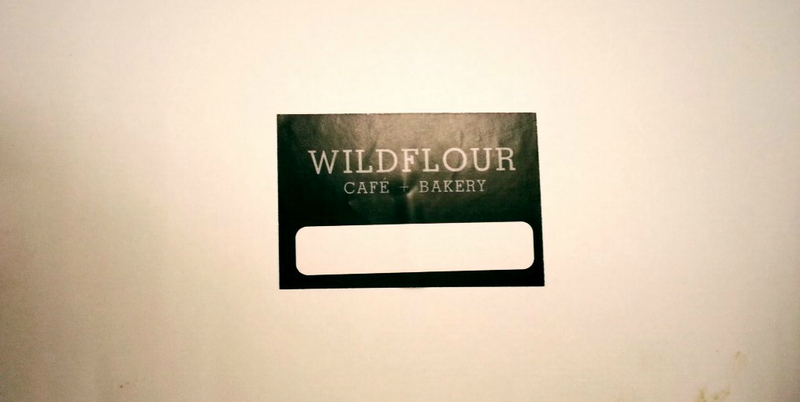 Around early June, Wildflour The Fort's Facebook page posted this picture which I suppose was an announcement that the Cronut has indeed arrived at our shores. 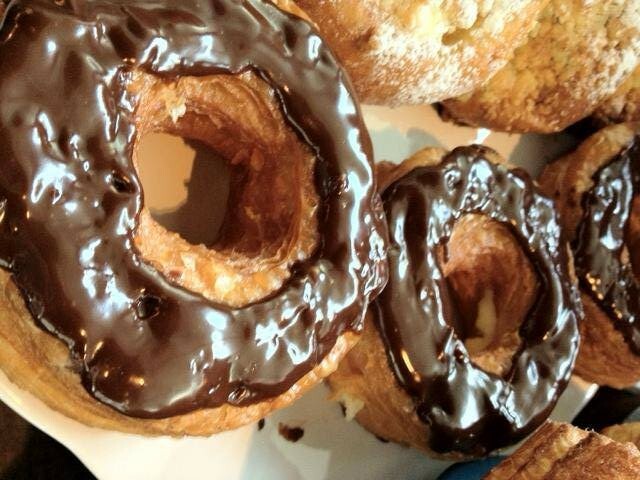 But Wildflour calls this croissant donuts to avoid infringement because Ansel has apparently filed for a trademark for the word Cronut, which he first coined. Read here about how Anna Lorenzana-De Ocampo of Wildflour Cafe + Bakery replicated Ansel's creation. We were able to swing by Podium around the end of last month because I was craving for Cupcake Lab's cupcakes. On the way up, I saw Wildflour Cafe + Bakery and kinda kicked myself (mentally) because I totally forgot this branch. 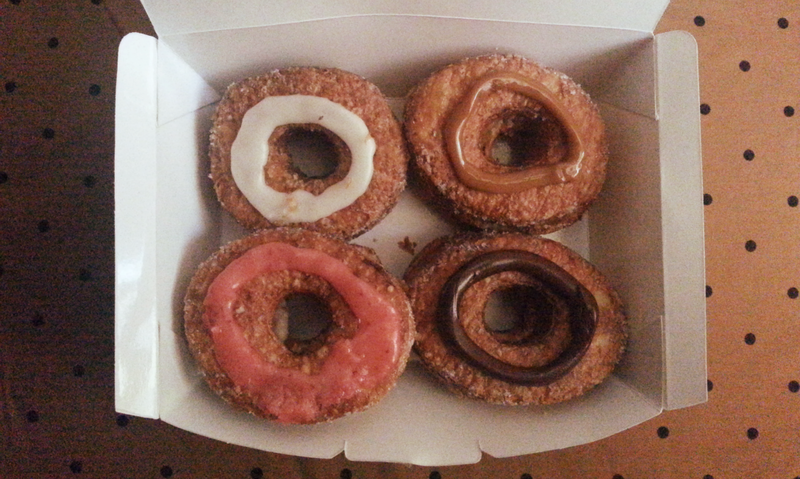 I've been waiting for the cronuts hoopla to die a notch down before trying it out myself. We went to the counter and can't find any cronuts displayed so I had to ask if they were serving it that day. They were serving the croissant donuts at specific times of the day only. And at the time I went there, it was 1:00 PM - 1:30 PM. We were 30 minutes early so we bought cupcakes and wandered a little before coming back. I was surprised to find a line building up considering Wildflour's space was small. Dulce de leche. Try the chocolate, too. The glaze was divine. I've never tasted Ansel's Cronuts so I don't know if this comes close to that. But this is a really a unique pastry dessert. It was crispy and flaky on the first bite like a croissant, but chewy halfway through. I loved the cream filling but I wish they'd put more. The dulce de leche glaze on top was sweet, just enough to bask the entire sugar-rolled croissant donut in its sweetness. As all other blogs say, it's great with coffee, tea or hot choco. In my opinion, it's not really that great but it's not just simply good either. It was something out of the box and certainly something I would come back for, something I wouldn't mind having once in a while. Is it worth all the buzz? It's something worth trying, I think, especially for sweet tooths like me. It is certainly something I can't resist. Is it just a fad? We all thought so with the milk teas and cupcakes and macarons but those had proven otherwise. Give it a try and you'll be the judge.